The Wellbeing Programme is a philanthropic initiative by Friends of Tibet, a non-profit organisation founded in 1999 to support the cause of Tibet and to create awareness about the issue of Tibet amongst people all over the world. This initiative researched, designed and implemented by Friends of Tibet aims at the restoration, propagation and promotion of the endangered traditions and practices of Tibet. Technopark, Trivandrum: On January 31, I hurried from an interview in Technopark to watch the Venerable Thupten Gedun make butter sculptures. It is an art passed on from monk to monk in Tibetan Buddhist monasteries. 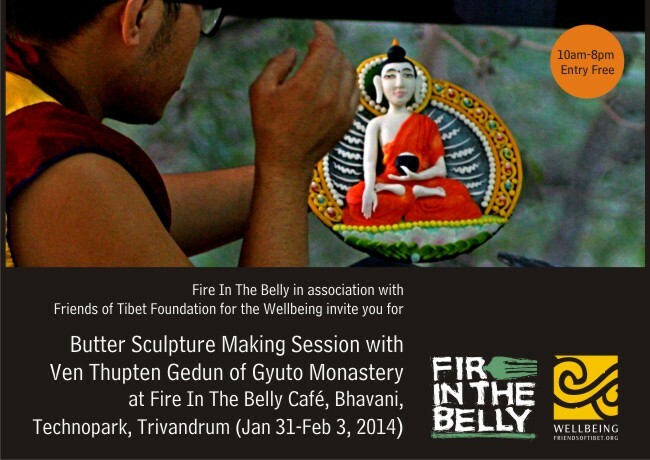 The event was organized by 'Fire in the Belly' café, Technopark and Friends of Tibet Foundation for the Wellbeing. The 'reforms' that followed further estranged Tibetans. In 1966, Mao Zedong launched the Cultural Revolution, shutting down most universities and schools, and banning Tibetan language classes. Everyone was encouraged to use a new, reformed language devoid of standard Tibetan grammatical usage. If not, they were branded as counter-revolutionary. Tibetan nomads were uprooted from their grasslands, to live in permanent building structures—away from animal herds, their livelihood. Government policies favour the Chinese race. Tibetans face severe unemployment, as access to proper education is limited. Proficiency in Chinese language is a must for jobs. The country has introduced a population transfer policy encouraging the immigration of Han Chinese settlers in Tibet—with subsidies, leniency on work permits, longer holidays and lesser work hours. Tibetans are increasingly becoming a disenfranchised minority in their own land. They are a mutiny, brewing. However, the Dalai Lama urges them not to resort to drastic measures. The words of their spiritual leader hold sway, even if most have never seen him. The Venerable Thupten Gedun—born in Nepal, living in India—calls Tibet his country. You suspect that there is no such country as Tibet. But he would say there is no country such as Tibet. For sixty years now, its people, with their relentless resolve, have been protecting everything Tibetan, including butter sculpture making. Indeed, there is no country such as Tibet. Technopark, Trivandrum: In a corner of a busy restaurant in Bhavani building in Technopark, sits an unlikely figure, making unlikely objects. Ven Thupten Gedun, a Tibetan monk, is busy sculpting butter, undisturbed by the afternoon rush. 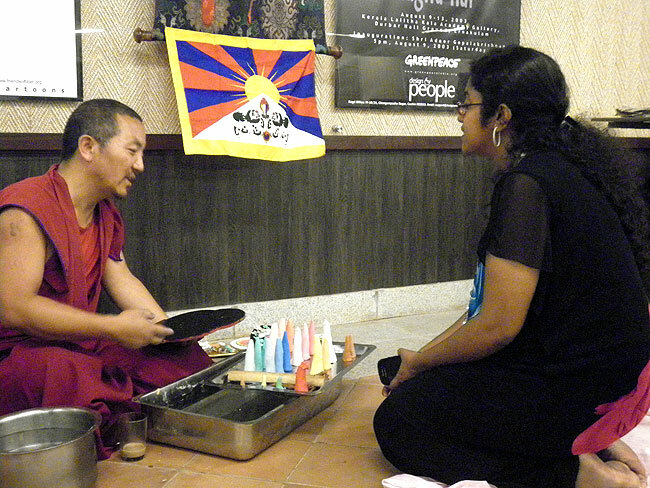 Gedun was here as part of a visit and workshop organised by Friends of Tibet, a non-profit organisation based in Mumbai. Passers-by and visitors to the restaurant stand and stare at him working, wonder writ on their faces. Thanks, perhaps, to the discipline of a monk's life, Gedun can focus single-mindedly on his delicate butter sculptures in the noisy environs. Even as one interrupts him tentatively to discuss this interview, he briefly responds, not wanting to be distracted from his task. Gedun, who is from the Gyuto Monastery in Tibet and based in Dharamshala, is as unassuming as the sculpture he is making. What does this delicate art mean to him? He says that butter sculpture plays a pivotal role in the worship and rituals of Tibetan Buddhism and that its origin dates back to around 650 years ago. They are offerings central to Tibetan Buddhist spiritualism. The offerings are made to mark the Tibetan Buddhist New Year celebrations. In India, schools of Gyuto and Gyume preserve the rituals by making these sculptures and passing on their skills. The sculptures Gedun has made are of Buddhist idols and deities and though there are a variety of butter offerings, he enjoys making idols the most, he says, shyly. There is a smiling Buddha, an elephant, flowers, all in a riot of pink, blue and yellow. Characteristic of Buddhist philosophy, the sculptures are destroyed after the rituals so that the sculptor does not get attached to them, explains Gedun. It is a difficult art, he says, since one has to keep the butter from melting while moulding it into shapes. In Kerala, it is all the more challenging since the temperatures are far warmer than in Tibet or in Dharamshala. He has therefore, mixed it with paint and candle wax to protect it from melting. Butter sculptures are also part and parcel of Gedun's routine in Dharamshala where he has been for the last five years. His typical day there starts at 4.30 am. 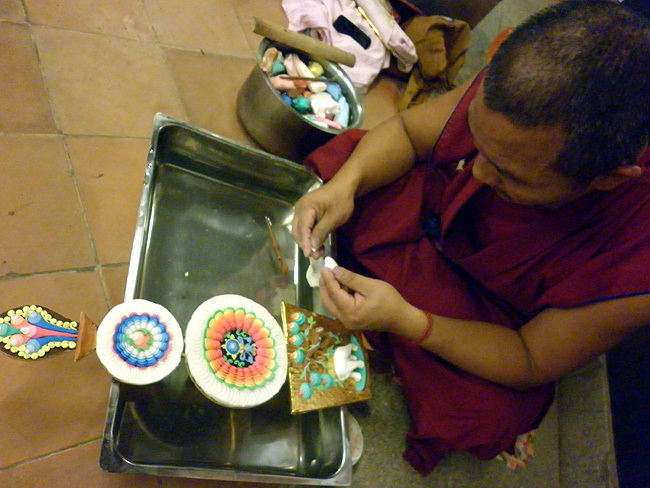 Much of the day is spent in worship and teaching the younger lamas who are trained in the mandalas. Their studies include butter sculpture and senior monks are required to pass on this ancient art to the younger students. So what prompted Gedun to become a monk? Born in Nepal, he was sent to Dehradun for studies at the age of five. At 12, he decided he wanted to be a monk when he grew up. He says unpretentiously, "It's not like I received a calling or had a vision... a monk's life seemed interesting to me. And my parents agreed and thought that it would suit me." 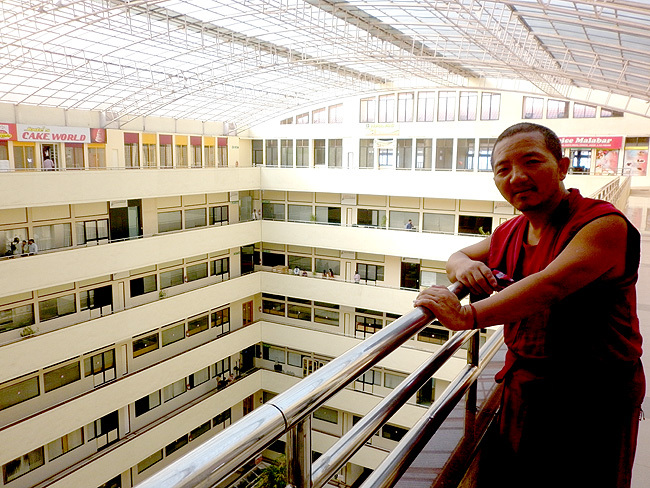 Gedun is thankful to Friends of Tibet who made his visit to Kerala and to Technopark possible. Interestingly, though sitting amidst IT professionals, he says that the monks actively try to keep technology at a distance. Internet and computers, mobiles with touch screens are all banned in the temples. "We need time for worship; a lot of time is wasted on technology," he says with a smile. Though ironic hearing the words in Technopark, they ring true. Trivandrum: Fire in the Belly restaurant in Technopark here in association with Friends of Tibet a non-profit organisation, that works to support the cause of Tibet and to create awareness about the issue of Tibet amongst people all over the world, under its Wellbeing programme is organising Butter Sculpture Making exhibition, in an attempt to restore, propagate and promote the endangered traditions and practices of Tibet. Thupten Gedun, a Tibetan monk of Gyuto Monastery, Dharamshala, will be the one who will be engaged in making the butter sculptures during the exhibition here. The monk who began his session with the making of one of the 8 religious symbols will gradually move on to the other motifs and will finally conclude with the sculpture of Buddha. The remarkable factor of this art is that the sculptures are made of real butter. The butter is mixed with various coloured powders before the work of molding is begun. The completed images are then attached to wooden panels of frames by means of ropes. "The work is very difficult, since we must take care to keep the butter cold in order to be able to form and mold it. Here in Indian climate it is all the more difficult as butter will melt easily and the process becomes even more difficult," says Thupten Gedun. So to prevent butter from melting the monk uses butter mixed with dalda. The butter sculptures, if preserved well in a cool environment, will last up to 5-6 years. "The butter sculpture which is considered a great art in Tibet is taught to every monk in the monasteries," says Thupten. The images of butter are used only for a particular festival celebrated on the fifteenth day of the first moon. As Tibetans follow the lunar calendar, the New Year usually occurs in February. And because their art is part of a religious belief the monks do not sell their sculptures. “Such exhibitions are organised as part of an awareness programme. Though the monks do teach their art to anyone who goes to them they do not go out to teach it,” says Sethu Das founder of Friends of Tibet. The exhibition is being organised as a curtain-raiser to the Losar festival celebrations which falls in March this year. Friends of Tibet Foundation for the Wellbeing, PO Box 16674, Bombay 400050, India.